Top seeds England and defending champions Egypt won wildly contrasting semi-finals of the WSF Men’s World Team Championship in Paderborn, Germany. England beat long-time rivals Australia courtesy of straight-game wins by their Yorkshire top pairing of James Willstrop and Nick Matthew, while Egypt won a thrilling late-night tussle with France in a repeat of the final of the last event, two years ago in Denmark. 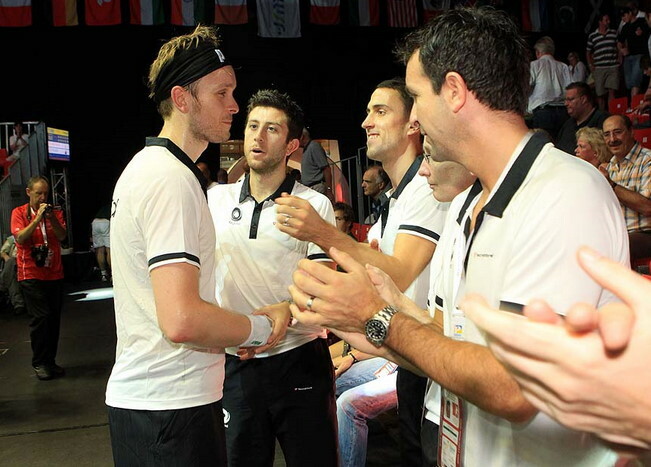 Favourites England and title-holders Egypt will contest Sunday’s final of the WSF Men’s World Team Squash Championship after contrasting semi-finals in Paderborn, Germany. England, four times winners of the title since 1995, comprehensively defeated fourth seeds Australia 3/0 on the spectacular new all-blue glass court at the Ahorn-Sportpark, thereby avenging their defeat by the record eight-time champions in the play-off for third place in the 2009 championship. England number two James Willstrop delivered his best performance of the tournament so far to despatch Cameron Pilley 11-7, 11-8, 11-2. Willstrop, the world No4, was extending his career head-to-head record over the world No14 to ten successive wins since 2007 – but played down their previous history. 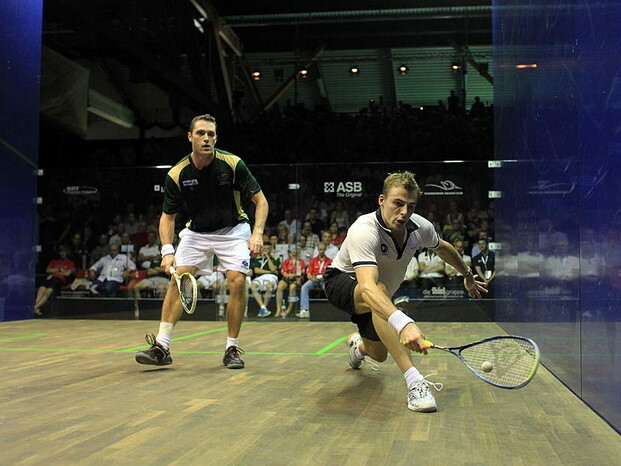 England now brought on their trump card, the world No1 Nick Matthew, also from Yorkshire, to face Aussie veteran David Palmer, a two-time world champion and former world No1. Going into the match, Palmer boasted a 12-9 career lead over his English rival over exactly ten years – but Matthew had had the upper hand since last losing to Palmer in the 2007 World Team Championship. But a fit and focussed Matthew brought down the Aussie, winning 11-5, 11-8, 11-5 in 58 minutes to take England into the final for the seventh time. “James led the way really well – which made my life a little bit easier,” said Matthew after his decisive victory. “It’s never easy to play David – but that’s the best I’ve played all season. Third string Peter Barker made it a clean sweep for England by beating Stewart Boswell 12-10, 11-8 in a best-of-three dead rubber. 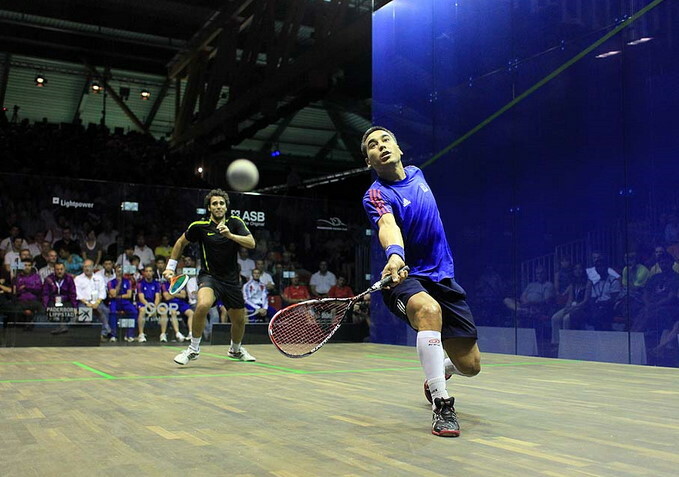 Later in the day Egypt, the No2 seeds lined up against third seeds France in the other semi. And the underdogs took a popular lead when Thierry Lincou ended an eight-match losing sequence stretching back to November 2006 by beating world No3 Karim Darwish 11-7, 3-11, 12-10, 4-11, 11-6 in a controlled 70-minute match. “We couldn’t have asked for a much better start,” said the 35-year-old former world No1 who finally seems to have put the effects of a recent injury behind him. “Personally, I’m proud of myself – it’s been a long and hard road back from injury, especially after losing first round after first round on the tour. I have had fantastic support from my friends and family and I now really feel motivated. But the French high was short-lived as top-ranked Egyptian Ramy Ashour levelled the tie with a stunning 11-6, 11-6, 11-6 victory over Gregory Gaultier, the world No6. It was the decider that had the packed crowd on the edge of their seats, however, as Mohamed El Shorbagy andMathieu Castagnet battled to put their countries into the final. After both players had game balls in the first, it was Egyptian El Shorbagy that drew first blood. Castagnet struck back to take the next two games to open up a 2/1 lead – and the 24-year-old world No56 moved ahead in the fourth. 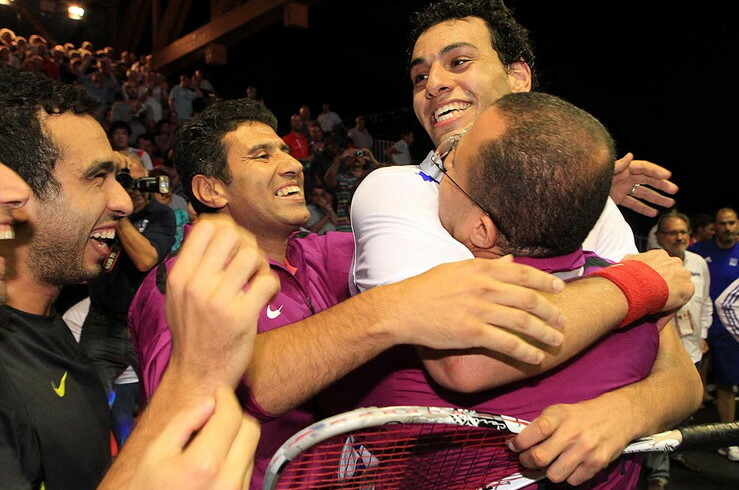 But 20-year-old El Shorbagy drew level and, after the lead changed hands in the decider, it was the world No9 from Alexandria who emerged triumphant, taking Egypt into the final for the fifth time since 1999 following his marathon 14-12, 9-11, 9-11, 11-7, 11-6 victory in 91 minutes. “I am so happy,” said Egyptian coach Amir Wagih. “Ramy is an unbelievable player and if he can play like he did just now in tomorrow’s final, England will find it very tough.